For most of us, dental hygiene is fairly high on our list of priorities. We brush, we floss, and we dread dental checkups, but we go anyways—or at least convince ourselves that we’ll set up the appointment. We all desire that pearly white, healthy smile and want to prevent things like cavities and gum disease, but with so many dental products on the market, it can be difficult to know which ones are right for us. Is traditional flossing better than water flossing? Will an electric toothbrush clean better than a traditional one? With every commercial telling us something different, it’s tough to decipher the advertisements and get to the facts. Water flossing uses an electric machine to shoot a pressurized stream of water into the mouth, using the water pressure to clean food, bacteria, and plaque from between the teeth and to massage the gums. Since there is no scraping against your gums, water flossing is thought to be easier on them and can more easily get to the back of the mouth where traditional flossing might have trouble. It is easy to use for people with braces or dental work like crowns and bridges and can be softer for those with sensitive gums. The Waterpik® Water Flosser was the first powered interdental cleaner to receive the American Dental Association (ADA) Seal of Acceptance. 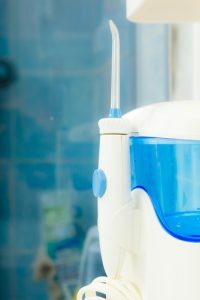 The Waterpik® can be expensive, especially when you compare it to the few dollars of a pack of dental floss; however, it will last longer than the floss, and there are less expensive alternatives to the Waterpik® that work similarly. Water flossing may not remove all plaque from the teeth, and since it is electric, you will also need access to an outlet and plenty of water to fill the machine, which makes it difficult if traveling. Floss has been around since the 1800s and is still considered a gold standard for dental hygiene. The string removes bacteria, plaque, and food particles from between the teeth and the gum line that brushing does not. 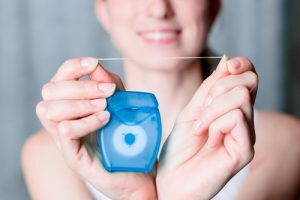 Dental floss is easy to control and is efficient, portable, and cheap; however, since you are passing a string between your teeth and in the tight crevices, it may be difficult to reach areas in the back of the mouth. It can also cause minor bleeding and gum sensitivity, especially if not done on a regular basis. Electric toothbrushes have become increasingly popular over the years and for good reasons. 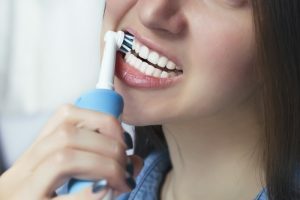 Several studies have indicated that certain types of electric toothbrushes may be better at preventing plaque and gum disease than the manual toothbrush, specifically the ones that have a rotational oscillating brush head (meaning that they have bristles that move in one direction and then the other). Electric toothbrushes are easy to use since the brush does all the work, and some even have a built-in timer to let you know when you are finished. This convenience, however, does come with some caveats. Because it is electric, it needs to be charged, which makes traveling with it a chore. It is also much bulkier than a manual toothbrush and is easier to break, especially if dropped. It also costs much more than a manual toothbrush. Although not as fancy, a manual toothbrush still gets the job done. Traditional toothbrushes are reliable products that will thoroughly clean your teeth as long as you brush correctly, meaning twice a day for two minutes each time. They’re cheap, sometimes even free with a trip to your dentist, and offer several varieties including color choices, brush size, and bristle strength, ranging from extra soft to hard. With manual toothbrushes, there is no need to worry about charging or batteries, and it is small enough to fit in a purse. 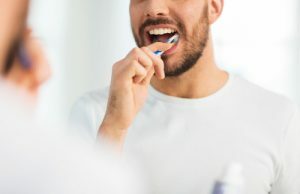 As the word “manual” implies, a traditional toothbrush is more work since you have to provide the brushing movement with good technique to get your teeth clean. This decision boils down to personal preference. What feels better for your mouth? Is it the ease of using a water flosser and an electric toothbrush, or do you prefer the traditional feeling of string floss and a manual toothbrush? Even with constant studies performed, there is still no clear winner. Some studies say that water flossing and electric toothbrushes have a higher percentage of plaque removal and a greater reduction of gingivitis, but truthfully, all of these products will do the job well. The most important thing is consistency. It is recommended to brush and floss your teeth twice a day and attend regular check-ups with your dentist. This entry was posted on Wednesday, November 8th, 2017 at 12:43 pm	and is filed under Electric Toothbrush, Flossing. You can follow any responses to this entry through the RSS 2.0 feed. Both comments and pings are currently closed.